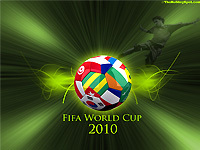 The FIFA World Cup 2010 is on and the soccer mania has reached its peak. But if you thought all the action is only happening at South Africa, rub your eyes and check out these amazing FIFA World Cup wallpapers from TheHolidaySpot that are designed to let you celebrate the tournament right on your desktop screen. Set these awesome images onto your PC screen and light it up with the fire that lurks in your football-crazy heart. 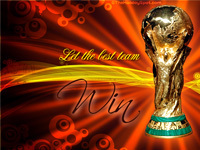 If you are impressed with our FIFA World Cup wallpapers, click here and refer the entire collection to your friends and loved ones. 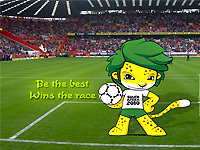 Share the spirit of the FIFA World Cup with everyone you know! Tip: Choose any of these marvellous wallpaper images themed to the FIFA World Cup and click on any of the links alongside it to get it in the size you want for your desktop. Once the image loads fully in a new window, right click on the image and choose "Set as Desktop Background" to set it as your desktop screen wallpaper. To send it online to your friends as a present, click on the link that appears above the wallpaper image when it loads in a new window.